We offer worldwide international courier services to both private and commercial customers. Parcel Post hold accounts with the top national and international courier companies and due to the volume of business we supply to them, we are able to offer discounted rates at a fraction of the normal cost. Choose an envelope or box for your item/s and then pack away. As long as your item/s fits in the envelope/box, you only pay the one fixed cost! (Please note, we do recommend a maximum weight for all our envelopes/ boxes. 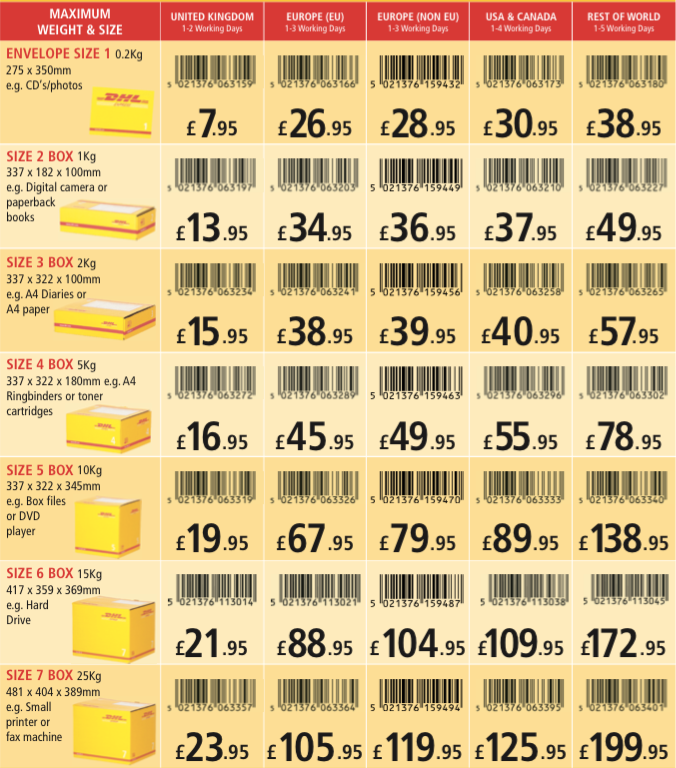 Once all of your items are packed away in the DHL box, you then pay one simple price based on size and delivery location. To make life easier, there are only four destinations to choose from: United Kingdom, European Union, USA/Canada, or Rest of World. You can then pay by cash, debit or credit card at Parcel Post Depot. Parcels to INDIA - Ahmadabad, Bangalore, Calcutta, Chennai, Delhi, Hyderabad, Kanpur, Mumbai(Bombay),Pune, Surat from £ 49.95 from 1KG. Custom duty is a tax which a state collects on goods imported or exported out of the boundaries of the country. It forms a significant source of revenue for all countries and becomes payable by the receiver on delivery of the items. You will need to know the packages weight, destination country and the dimensions in cm. You will be charged the higher of the actual and volumetric weight. If you are sending a multiple consignment, calculate each price separately. Multiply the length x height x width in centimetres and divide the answer by 5,000. The result is the volumetric weight. The answer should be compared with the actual weight in kg. Whichever is the greater figure is the chargeable cost. All packages will be volumetrically scanned before leaving the country. If there is any difference between the declared weight and the volumetric weight, you will be charged the higher amount. Assume the actual weight of your package is 8kg, but the dimensions are 40cm x 30cm x 50cm = 12kg. The volumetric weight of 12kg is greater than the actual weight of 8kg, and so the volumetric weight would be used in calculating the price to be charged. If your package is irregularly shaped, the volumetric weight is calculated based on the dimensions of the smallest cubic shape the package will fit into. Volumetric charging of international multiple parcel consignments. Imagine three packages are being sent as a multiple consignment. Package 1 has an actual weight of 1.5kg. 30cm x 30cm x 15cm /5000 = 2.7kg, therefore volumetric weight will be used as it is greater. Package 2 has an actual weight of 3kg. 30cm x 32cm x 15cm/5000 = 2.9kg, therefore actual weight will be used. Package 3 has an actual weight of 5kg. 40cm x 30cm x 50cm/5000 = 12kg, therefore volumetric weight will be used. After the above calculation: Total actual consignment weight = 1.5kg + 3kg + 5kg = 9.5kg. Therefore 17.7kg would be the weight to use for the service you require in this example. If your consignment is over 20Kg please contact our customer services department for an immediate discounted quote. All shipments are rounded up to the nearest half kilo. You will be charged the volumetric weight if it exceeds the actual weight. A Custom's declaration and out of service area surcharge may apply to certain countries. Customs duties and local taxes payable by the consignee. 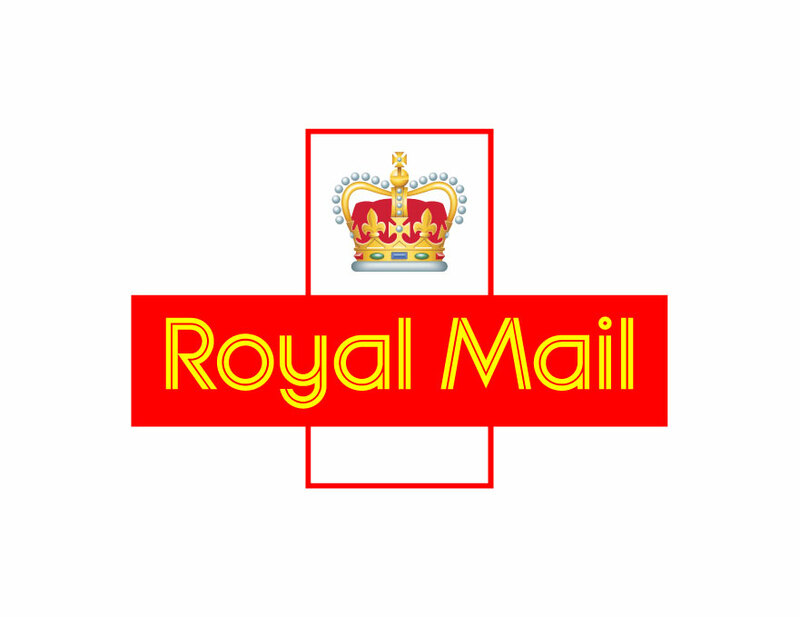 Please feel free to contact us to discuss a package to suit your needs by emailing info@parcelpostdepot.co.uk, completing our online enquiry form or by calling us 0845 649 49 49.